You hear a lot about how drones will change the future of farming… but how much of this is true? What tools are available today and how can they impact your bottom line? 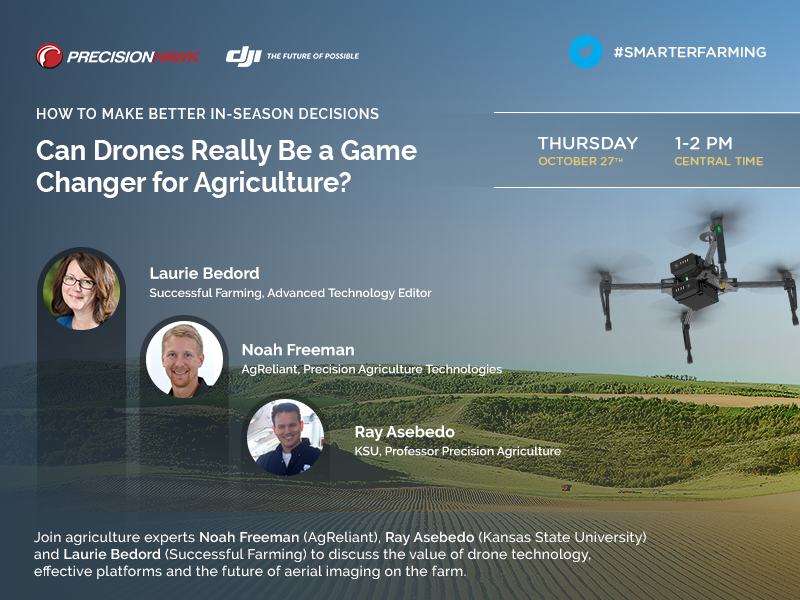 DJI and PrecisionHawk host agriculture experts Noah Freeman (AgReliant), Ray Asebedo (Kansas State University) and Laurie Bedord (Successful Farming Magazine) to discuss the value of drone technology, effective platforms and the future of aerial imaging on the farm. Laurie Bedord is the Advanced Technology Editor for Successful Farming magazine, the Successful Farming Show and Agriculture.com. She has been covering ag technology and machinery for nearly twenty years. A graduate of Simpson College, she is originally from upstate New York where her family owned and operated a 200-herd dairy farm and grew corn, soybeans and alfalfa. As the Manager of Precision Agriculture Technologies since January 2014, Noah Freeman has led the development of AgReliant Genetics’ precision agriculture platform, Advantage Acre. Noah has a Bachelor of Science from the University of Illinois in Crop Sciences, an Master of Science from the University of Illinois in Plant Pathology and Breeding, a graduation certificate in Geographic Information Science from Northwest Missouri State University and is currently working to complete a doctorate in Agriculture Systems Management from Purdue University with a focus on precision agriculture. Ray Asebedo is a Kansas native. He received his bachelor's in agronomy and Ph.D. in soil fertility and is serving as assistant professor of precision agriculture at Kansas State University. Dr. Asebedo has focused his research program on developing agronomic algorithms to drive the artificial intelligence of ground and aerial autonomous vehicles (GAVs, UAVs). He enjoys working with producers out in the field and helping them utilize technology in their farming practices for maximizing profit per acre. Register now to join the free webinar where you can directly ask this panel of experts how aerial imaging technology is impacting your agriculture business or learn more to get started!